Suspected Islamist militants have raided a Nigerian village and murdered dozens, according to witnesses. The gunmen reportedly rounded up a group of men in Izghe village and shot them, before going door-to-door and killing anyone they found. 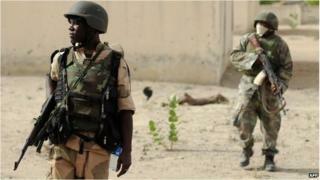 Officials said they suspected the Boko Haram group was behind the attack. Boko Haram, which claims to be fighting to create an Islamic state in northern Nigeria, is notorious for extreme violence and indiscriminate attacks. The senator for Borno state, where the attack took place, told the BBC's Newsday programme that 106 people - 105 men and an elderly woman trying to protect her grandson - were killed in the latest attack. Ali Ndume said around 100 Islamist militants attacked Izghe for five hours on Saturday evening, without any intervention from the army. He said the military recently withdrew from the area after nine soldiers were killed in an ambush last week. Residents who fled the attack in Izghe said some of the victims were shot, while others had their throats slit. "All the dead bodies of the victims are still lying in the streets," resident Abubakar Usman told Reuters news agency. "We fled without burying them, fearing the terrorists were still lurking in the bushes." Other witnesses described how the attackers had arrived on Saturday evening in trucks and motorcycles. They asked the men in the village to gather, and then they hacked and shot them to death. Senator Ndume said it was very painful for him as he knew some of those who had been killed, yet it was too dangerous for him to pay his respects in person. "I cannot interact with the people I represent. I feel very, very bad about it," he said. More than 30 people were killed in the town of Konduga, also in Borno state, earlier this week in an attack blamed on Boko Haram. Following the attack in Konduga, the governor of Borno state, Kashim Shettima, called for more troops to be deployed to combat Boko Haram militants fighting in the area. Numerous villages in the area around the state capital of Maiduguri have been attacked in recent months, despite the state being under emergency rule. Frustrated with the army's efforts to combat the rebellion, President Goodluck Jonathan replaced his top military brass on 16 January. The attack on Izghe is the biggest since those new appointments. Boko Haram has killed several thousand people - Muslims and Christians - since it launched a campaign of mass violence in 2009.